During the first eighteen months of rock ‘n’ roll music The Five Scamps contributed just one side which could reasonably be included in the roll call of songs under that heading and it was no sure thing that it’d even qualify. But in the last five months they’ve had four separate releases and all of them have been included – this being the fourth – and there wasn’t much debate over whether they fit comfortably or not. In fact, listening to them it’s hard to see how there was ever much doubt as to their belonging here. The answer is: Virtually everything. When Columbia Records, the oldest and most prestigious of the major labels, signed the group it was surely a half-hearted compromise to get into the rock field without actually stooping so low as to get somebody well-suited for this roughhouse brand of music. But The Scamps managed to cross everybody up after coming on board and changing their names to The Five Scamps, a small alteration in theory maybe but it seemed to have sparked a Jekyll & Hyde like musical transformation as well. Their initial two offerings, a cover of the recent smash Chicken Shack Boogie and the even more outrageous original Red Hot, proved to one and all that no matter how low the expectations were these guys had it in them to take their place alongside anybody in the field. But maybe that was the problem… at least for Columbia who seemed to have gotten more than they bargained for with this signing. Rather than serve as a modest alternative to the wilder rock acts as the label surely had anticipated, The Five Scamps were shaping up to be a group that might actually be deemed legitimate rockers who could credibly execute this audacious music. In doing so however there was the very real chance they’d sully the longstanding reputation Columbia had as being the classiest of record labels. Yet as distasteful as this crass noise may be to their highfalutin’ ideals the company also wanted hits, and Red Hot had scored very high on regional charts all across the country. There was no longer any denying that this type of music had legs and it was becoming clear that Columbia would need to reach that demographic to remain relevant as it grew in popularity. What was a record label steeped in musical snobbery to do? Well, it would seem that they convinced The Five Scamps to dial it down slightly by releasing rock-styled records that were not quite so rowdy, so uncivilized… so authentic. 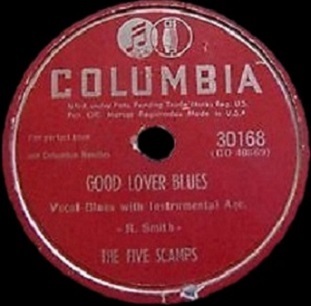 Which leads us to Good Lover Blues, a record positioned halfway between their exciting forays from back in March and their latest, far milder record for just a few weeks earlier, Fine Like Wine. In doing so Columbia was attempting a precarious balancing act with the group that would enable them to still be able to pull in the rock fan while not offending their more high class clientele, all the while probably hoping this rock ‘n’ roll garbage would turn out to be just a fad after all, counting the days until they could kick these double-crossing bums to the curb altogether. As compromised efforts go… this actually isn’t bad at all. In fact at times it’s quite good. Certainly the best aspect of it is the composition itself. Not that it’s anything revelatory, but it doesn’t pull any punches as you’d surely fear upon seeing the label issuing it. Good Lover Blues is a thoroughly convincing song lyrically for the subject matter. Earl Robinson delivers this virile boast about his desirability as if he’s speaking off the top of his head while hanging around the fellas on a Friday evening before they’re all about to head off to try and pick up girls for a good time. I would guess the others are in a bit of a slump in these endeavors and so Robinson, good pal that he is, feels compelled to rub it in by bragging about his own recent run of luck. The crudity of his boasts aren’t exactly off-putting however, even when he’s positioning himself as the answer to every girl’s prayer. He’s fully confident in his… umm… abilities (?) in this area and if they’re at all exaggerated he’s blissfully unaware of any complaints from the ladies. If it’s possible to be both slightly crass and still endearing Robinson fits the bill. As those who took copious notes on the previous Five Scamps entries remember he’s one of two lead singers they employed (along with James Whitcomb) and for this song he’s clearly the right choice as his high-octane whine is suitably revved up throughout. Whitcomb by comparison used a sly semi-spoken delivery which would’ve brought a far different set of implications with these lyrics, more lecherous and even pimpish than Robinson’s charmingly egotistical bragging. All of this is housed on a solid medium to fast tempo frame that is sleek in appearance and runs smoothly. The melody – carried primarily by Robinson’s voice – sticks in your head and uses an effective array of hesitation moves leading up to notes he holds for a beat or two longer, all of which leaves an even greater impression. To think this is the same guy who crooned the slow and dreamy Solitude way back in late 1947 is rather hard to believe, but Robinson is shaping up to be one of the more underrated vocal talents in rock’s formative years and this is a prime example of him at his best. The same can’t be said of the other four Scamps this time out however, as their instrumental accompaniment doesn’t live up to their lead singer’s efforts. Now we KNOW these guys can play, as anyone who heard their scalding work on Red Hot can attest, but whereas that was balls to the wall rocking with everything taken at top speed until you clung to the railing with white knuckle intensity, Good Lover Blues eases back on the pace. That may be understandable and even necessary for the song itself, but unfortunately they also ease back on the sonic textures that made the earlier record so eye-opening. Back then their arrangement itself was thoroughly up to date, no archaic components were slipped into the fold and they focused intently on pushing the rhythm section to the breaking point and then emphasized the pandemonium even more by letting Rudy Massingale tear loose with a perfect tenor sax solo that was not just invigorating but melodically exotic as well. Here they’re far too conservative, seemingly intent on dragging themselves back to the shadows of yesterday with the squawking horns and gently rolling riffs. If Red Hot had been played like convicts busting out of prison and making a mad desperate dash for freedom under a hail of gunfire, Good Lover Blues sounds as if it’s being played by those who stayed put in their cells even after the walls of the jail crumbled around them while they remained intently focused on their canasta game amidst the smoke from the tear gas. The melodic structure itself is played without any spark. They’re going through the motions for the most part, perhaps having been told by the powers-that-be at Columbia to tone it down some, or maybe rationalizing that this song’s different theme doesn’t require them to act as if they were losing their minds and so rather than draw too much attention to themselves and maybe draw the ire of their record company in the process they try remaining unobtrusively in the background. But all that really winds up doing is drawing MORE attention to their modest aims, especially once you hear that somebody smuggled a trumpet into the session. While he thankfully doesn’t get a solo of his own, he does intrude on Massingale’s sax solo by echoing the lead lines in a way that can only be called disconcerting for those who actually were looking forward to what Rudy was laying down. Massingale’s part is fine unto itself… nothing spectacular by any means, but hardly out of place, yet because he can’t get the entire spotlight to himself your attention wanders too much from him. Far better are his intermittent injections in a lower register behind Robinson’s lead vocals, not that they are intended to add more than texture but they at least give the song a little more in the way of attitude. In the end they never quite trip Robinson up in their tepid accompaniment but they hardly are adding anything notable to the record either and that seems as if it was clearly by design. Truthfully considering all the circumstantial evidence – the origins of the group and their unexpected transformation; the record company’s conflicted and half-hearted attempts to pursue this market while still trying to insist it fell under the more respectable broader old-school black pop-jazz-novelty approach; and the up and down efforts they’ve combined to put out to date – Good Lover Blues comes across as not just a compromise between two divergent musical and commercial ideals but almost the textbook definition of such a plan. Forced to choose which aspects to emphasize they wind up neglecting the musical side of the equation to focus more on the vocal and lyrical work which manages to give the record some genuine appeal, but those concessions also guarantee it won’t have anybody clamoring for this much after they take it for an initial spin. In the process you come to conclusion that, in spite of their brief flirtation with perfection in the not so distant past, they’ll never have it in them to take over the field as you might’ve hoped. All things considered that’s probably to be expected. But at the same time this record is decent enough in its own right that you won’t be discarding them altogether. In the end it also means that Columbia Records may just have achieved their insidious goal to successfully straddle the fence after all. The highs and the lows do tend to balance out in music as well as life and when it does this is what you’re generally left with – pleasant mediocrity. 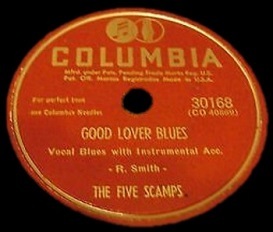 Leave a reply on "The Five Scamps: “Good Lover Blues”"